Technology is amazing. We have a world of information at our fingertips. Our cell phones have more computing power than my brother’s Commodore 64 computer from 1982. The idea of Maxwell Smart’s shoe phone in 1965 was absurd and comical. In 2010, iPhones are common, almost expected. There are gadgets and gizmos that turn Science Fiction in reality. We have personal navigation systems to get us from Point A to Point B. No more getting lost on the family vacation. We can entertain our children on car trips with their favorite dvd. No more warring over who is touching whom in the battle of the back seat on that family road trip. But as much as technology enriches our lives, it also removes us from experiencing life itself. I have witnessed two people sitting at the same table completely ignoring each other. They are engrossed in texting and surfing and experiencing the virtual world instead of engaging with the person sitting across from them in the real world. I’ve seen a parent completely ignore her child at a restaurant while she droned on and on and on into her cell phone. Tell me that child isn’t going to have self esteem issues. I personally do not blather away on my cell phone when I am driving, walking, shopping, or generally in the presence of another human being. I don’t care to share the details of my upcoming hair appointment or Aunt Gertie’s test results with the rest of the world. And I’m really not interested in hearing about your Suzie’s playdate/recital or how the world is screwing you over while the cashier at Target is scanning your Capri Sun and Goldfish crackers. And can we all just agree once and for all that the only thing you should be doing behind the wheel of your car is driving? Despite my Luddite way of thinking, and my ownership of a handheld personal device (when did a phone stop being a phone? ), I believe there is an unfilled niche in technology that I would pay good money for. I’d like to see a gps that can help me navigate my personal life. I’d like to have a soothing voice guide me into making a U Turn back to the frozen food section when I veer off track and put a gallon of Ben and Jerry’s in my grocery cart. Wouldn’t it be great if a gps could warn me that there is an emotional detour ahead that I should prepare for and even suggest an alternate route to get me to my happy place? How many arguments could be avoided if I had a gadget warning me of road work or speed bumps in my relationships? I’d pay any amount to be warned ‘bad decision ahead, do not yield’. If only I could plot my inner course with the precision and accuracy of a Garmin. Sure getting lost can lead to some of the most unexpectedly wonderful discoveries but sometimes I get lost in my own lostness and can’t find my way back to the main road. The emotional wear and tear of driving around in circles isn’t covered under any powertrain warranty. Until technology can make the emotional gps a reality, I guess I’ll have to travel these roads of life old school. If you see me pulled off on the shoulder, please call AAA, or maybe my therapist. I’ll be needing one, if not both, of them. BAH Note: I also wouldn’t mind a cooking gps to tell me to go left when a recipe says to go right. I think I would have enjoyed these more if I had veered off course with the recipe just a bit. I should have trusted my instincts to cook them less because all the steaming, boiling off, and final addition of butter and lime juice left me with soft and soggy sugar snaps. I wonder what would happen if I used the lime juice instead of water to steam the peas? The flavor might become more pronounced and concentrated and I wouldn’t have quite as much liquid to render the sugar snaps soft. Next time. I also wish I would have used the full 1/4 teaspoon of curry paste. But I wimped out and because of that, my sugar snaps didn’t quite have that spicy bite. Melt one tablespoon of butter in a large frying pan over medium heat. Once the butter melts, add the curry paste and stir with a spatula until it is fairly well distributed in the pan. Add the sugar snaps and stir to coat with the melted butter and curry paste. 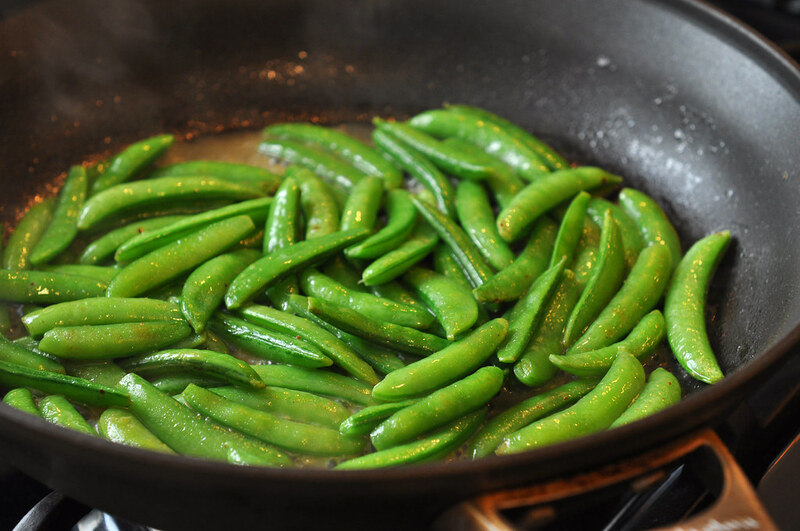 Add the water, partially cover the pan with a lid, and cook over medium high heat for about 3 minutes until the sugar snaps are almost tender. Remove the lid and boil off any remaining liquid. Add the remaining tablespoon of butter and lime juice. Season to taste with kosher salt and serve warm. Wendi–even the GPS will sometimes lead you to a dead end…you just need to keep on driving! Get cracking on that invention, Wendi! I’d love something to warn me of impending emotional shitstorms. Kitch, that would be a million dollar invention for sure. Emily, I can’t include sesame seeds but totally agree that they would be a great addition.